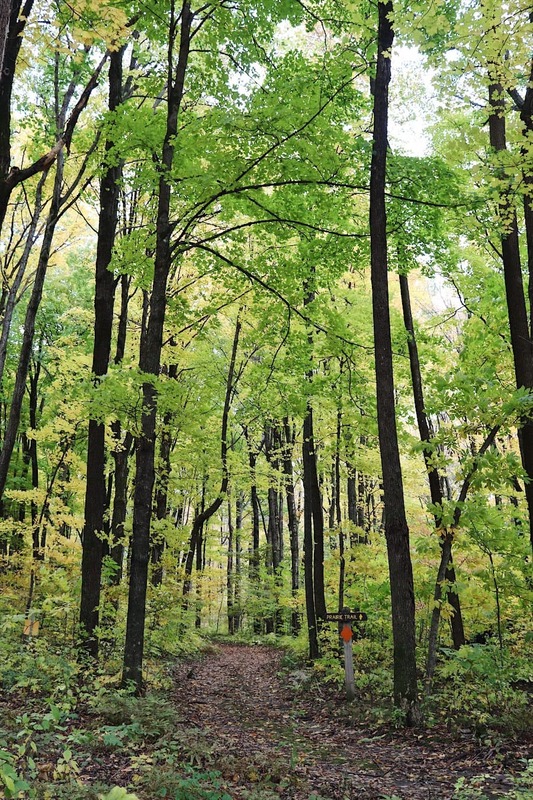 Even if you don’t live in Minnesota (or near Nerstrand-Big Woods), consider visiting one of the parks in your state for an affordable day-trip or weekend adventure. In my experience, many state parks (even in other states) cost less than $10 a day and offer a variety of outdoor activities. Plus, I’ve found hiking to be one of my favorite ways to move my body, unplug, and relieve stress. Fall is filled with so many of my favorite things (fall colors, pumpkins, Halloween, etc.). It also means my outdoor sports-loving husband is gone most weekends from mid-September through November. Luckily, my sister is always up for an adventure. So, last weekend we decided to get outdoors, move our bodies, relieve a little stress, and explore Nestrand-Big Woods State Park. 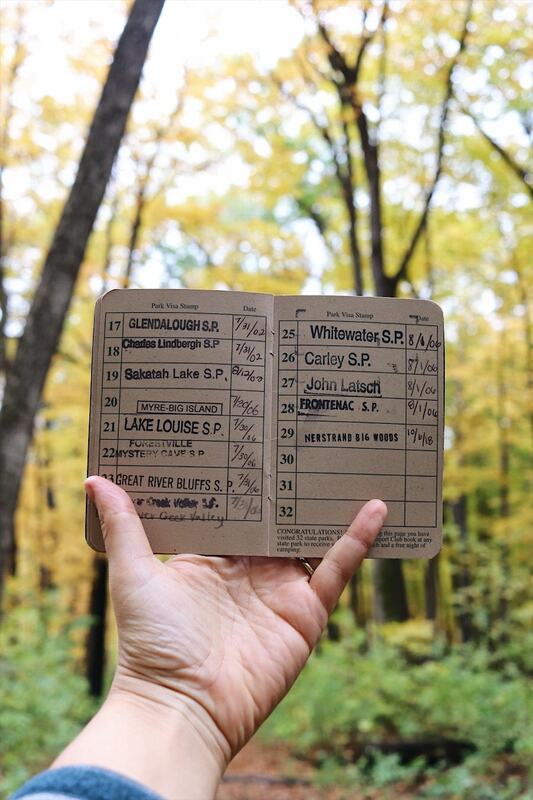 A little back story … when we were little, our parents gifted us Minnesota state park passports (pictured above). These little books challenged us to collect stamps and keep track of all of the state parks we visited. We made good headway while we were still living at home, but it’s been a few years (okay like 12) since I’ve visited a new Minnesota state park. As Mar (my sister) and I are already working on visiting all of the U.S. National Parks, we decided we might as well also set a more local goal and visit all of Minnesota’s beautiful state parks to fill our “passports”. 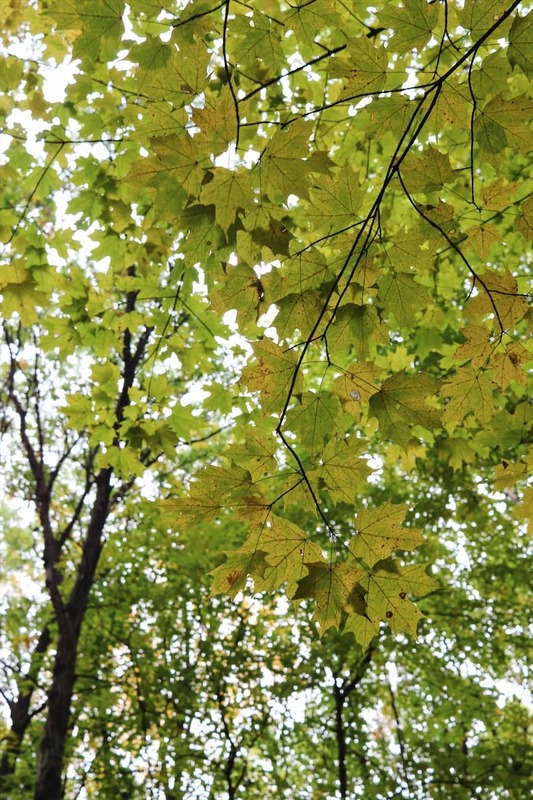 Last weekend, we settled on visiting Nerstrand-Big Woods State Park because it was a relatively central meeting point for us (we live three hours apart) and the Minnesota Fall Color Finder indicated it would be a prime location to “chase the colors”. 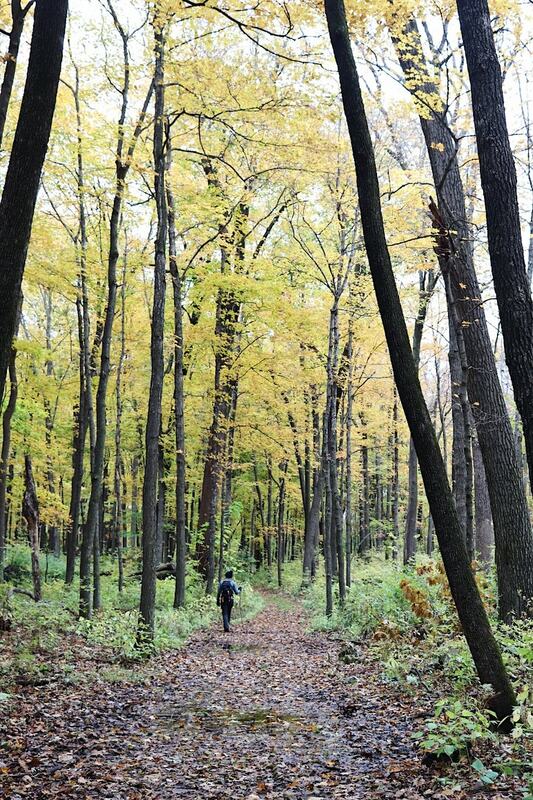 Nerstrand-Big Woods State Park is located about an hour south of the Twin Cities, near Faribault, Minnesota. To access the park, you’ll need a day pass ($7) or annual park permit ($35). We both live near state parks and visit multiple times a year, so we both currently have annual passes. Although coming from different directions, we both drove through southern Minnesota’s farmland to get there. After miles of corn and soybean fields, this pocket of “big woods” seemed to appear out of nowhere which was really cool and even from afar the fall colors did not disappoint! We arrived around 1 pm, and for a brisk, fall day, we were surprised to find the park’s parking lot overflowing. It was awesome to see so many people getting outside and taking advantage of all of the park’s amenities! From the get-go, I opted to leave my phone in the car. I had my DSLR camera (with an unknown at-the-time dying battery) to take photos and knew I wasn’t going to need my phone for anything. This simple act allowed me to further unplug and be more fully present – something I am constantly working on. It also eliminated the temptation to pick up my phone and aimlessly scroll. 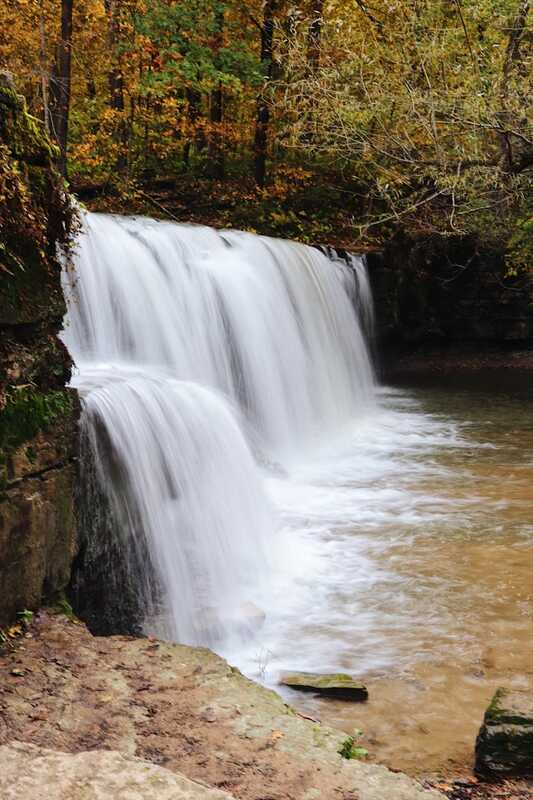 After collecting our passport stamp and a map at the visitor’s center, we set out towards one of Nerstrand-Big Woods most popular attractions, the Hidden Falls. Although a little crowded, the waterfall was definitely pretty and only a short (~0.5 mile) walk through the forest. From the falls, we combined several other trails (Fawn, Beaver, and White Oak) to make a larger (3.5 mile) loop back to the parking lot. On these trails, we only encountered a couple of other people, so it was a great time to take in the forest colors without a lot of distractions and catch up with my sister. After having a quick snack break in our car (I packed FODMAP-friendly macadamia nuts and jicama sticks), we set out to explore the southern part of the park. The loop we chose was White Oak to Big Woods to Ironwood to Fox trail. This relatively flat ~2-mile hike had no one else on it. It was a little mucky (we visited after a really rainy week), but this trail was probably my favorite because of the massive (for MN-standards), colorful trees and the info plaques that dotted the Big Woods trail. All in all, we spent a good four hours at the park and had so much fun exploring Nerstrand-Big Woods for the day. It was a perfect short trip and a great reminder that you don’t necessarily have to travel far to have an awesome adventure. What’s your favorite way to de-stress? Let us know in the comments below!